1920s India: Perveen Mistry, Bombay's only female lawyer, is investigating a suspicious will on behalf of three Muslim widows living in full purdah when the case takes a turn toward the murderous. The author of the Agatha and Macavity Award–winning Rei Shimura novels brings us an atmospheric new historical mystery with a captivating heroine. This Deluxe Paperback Edition features: an interview with the author, discussion questions, essays on the real-life inspirations behind the novel, delicious recipes taken from the story, and previews of The Satapur Moonstone (May 2019). Sujata Massey was born in England to parents from India and Germany, was raised mostly in St. Paul, Minnesota, and lives in Baltimore, Maryland. She was a features reporter for the Baltimore Evening Sun before becoming a full-time novelist. Her novels have won the Agatha and Macavity awards and been finalists for the Edgar, Anthony, and Mary Higgins Clark prizes. Visit her website at sujatamassey.com. 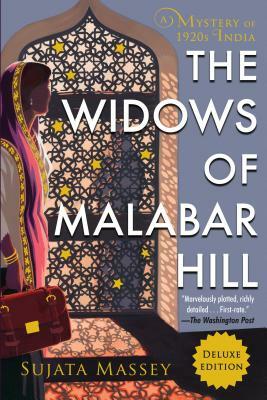 “The Widows of Malabar Hill, with its deft prose and well-wrought characters, is a splendid first installment in what promises to be a memorable series." "Marvelously plotted, richly detailed . . . This is a first-rate performance inaugurating a most promising series." "Perveen Mistry has all the pluck you want in a sleuthing lawyer, as well as a not-so-surprising—but decidedly welcome—proclivity for poking her nose into the business of others. The pages do indeed fly." "The Widows of Malabar Hill contains multitudes, tackling women’s history and rights, while treating readers to a riveting story." "Perveen’s dogged pursuit of truth and justice for her clients is reminiscent of the debuts of Anne Perry’s Charlotte Ellison Pitt and Jacqueline Winspear’s Maisie Dobbs. But the multicultural, multi-faith milieu in which Perveen lives, works and attempts to find love both illuminates a bygone era and offers a thoughtful perspective relevant to today’s focus on women’s rights and equality." "A fascinating setting, an extraordinary new sleuth, and a story that enthralls you—The Widows of Malabar Hill has all three and more. Sujata Massey's new historical series is absolutely terrific, and you are just going to love Perveen Mistry, India's first female lawyer." "Perveen Mistry is an extraordinary heroine—one of the first female lawyers in India, she’s whip smart, strong-willed, and, most importantly, compassionate. Defying convention while draped in a sari, Perveen is sure to join the leads of great mystery fiction." "You get a mystery but you also get all the cultural details. I like that." "I've been complaining for several years now that we don't have enough competent female leads in mystery series, and Sujata Massey has delivered with The Widows of Malabar Hill. I was taken in by this Law and Order-esque tale set in lush, swing-era Bombay, and I loved seeing Perveen proceed with a cool head and a fiery heart. Readers looking for a strong female heroine, a vivid setting and a strange mystery will find it here." "There’s so much to admire in Massey’s writing: sumptuous details, attention to the senses and a tightly-plotted mystery that explores domains beyond normal trials and tribulations. It’s writing that’s easy to take for granted, but as we know, anything that easy is deceptively hard." "Massey deftly evokes the sights, the sounds, and the heat of Bombay as her clever and determined heroine, aided by a large supporting cast of sharply-drawn characters, sidesteps both custom and danger to deliver justice." "Massey's extensive research of Bombay during British imperial rule, its various ethnic communities and their respective legal customs, is seamlessly folded into the fabric of the story. The book is filled with fascinating bits of culture and history, a look at India's Parsi and Muslim communities, well-written courtroom scenes, and even a locked-room murder." "A spectacular mystery to kickstart your year." "Perveen is the kind of plucky, determined, practical, wounded, ahead-of-her-time protagonist an avid clique of mystery readers adore. She is destined to find a home with fans of like-minded female investigators such as Mary Russell and Maisie Dobbs, whose creators, like Massey, deftly anchor their solid plots in the realities, and challenges, of their times." "I can’t wait to see what happens next." "A sneaky feminist masterpiece wrapped up in a cozy whodunit . . . just genius." "[A] setting and protagonist are like nothing I’ve encountered in a mystery before: 1920s Bombay and one of India’s first female lawyers, who’s 'devoted to championing and protecting women’s rights.'" —BookRiot's "44 Mystery Romance Novels to Read Right Now"
"A compelling look into Indian society through the eyes of a remarkable heroine." "[An] outstanding series launch . . . The period detail and thoughtful characterizations, especially of the capable, fiercely independent lead, bode well for future installments." "[Massey] does a wonderful job of taking life in India at the beginning of the 20th century. She gives enough cultural details without overwhelming readers with facts. The two plotlines wonderfully depict the development of the main character and the mystery as it unfolds . . . Fresh and original." "In addition to getting an unusual perspective on women’s rights and relationships, readers are treated to a full view of historical downtown Bombay—the shops and offices, the docks and old fort, and the huge variety of conveyances, characters, and religions—in an unforgettable olio that provides the perfect backdrop to the plot and subplots. Each of the many characters is uniquely described, flaws and all, which is the key to understanding their surprising roles in the well-constructed puzzle." "[A] highly original story and satisfying ending make this a promising series debut." "History and culture blend in an involving and fast-paced mystery . . . Perveen is a fascinating character—smart, resourceful, ready to take on prejudices against women in the law." "[A] lush, captivating debut series about 1920s Bombay." "An enticing and enlightening whodunit that addresses social issues and India’s multiple cultures." "There is a new sleuth on the literary map and her name is Perveen Mistry, practicing woman lawyer, feminist, survivor of abuse and solver of murder mysteries. In The Widows of Malabar Hill, Sujata Massey brings 1920s Bombay to life, a time when the British still ruled, single women were not served alcohol in restaurants and there was murder most foul. With an indomitable heroine and a solid cast of sidekicks, this is the start of a series mystery readers should not miss." "Perveen is strong, tenacious and smart, just the kind of advocate you'd want to have on your side. And as someone who was born and raised in the city, I love the way in which Massey recreates colonial Bombay, down to the architecture, social interactions,politics and gender dynamics. You can feel the breeze coming off the Arabian Sea and taste the pastries at Yazdani's bakery." "Introducing an incisive, sympathetic heroine with a painful past while shedding light on a fascinating cloistered historical world, The Widows of Malabar Hill is not only immediately engaging—it has staying power." "Perveen Mistry is a rarity: a female solicitor in a bastion of masculinity! An astonishing heroine—fearless, intelligent and determined—she makes a memorable debut in Sujata Massey’s The Widows of Malabar Hill. A gripping whodunnit, full of excitement and heart, the novel also delightfully evokes Bombay in the 1920s—and celebrates the Parsi community that continues to enrich their beloved city." "Sujata Massey is one of the most talented writers working today. In her hands, 1920s Bombay comes alive with the sounds, sights and smells of a place and time where women were still second class citizens. Perveen Mistry is an unforgettable heroine, fighting for justice in an enigmatic, beautiful and flawed world. With gorgeous prose, Massey weaves a captivating mystery. The Widows of Malabar Hill is an extraordinary novel." "Wonderful . . . A rich blend of history and fiction, [The Widows of Malabar Hill] brings historical Bombay to vibrant life in this engaging mystery." "One of the great joys of this novel is the life Massey brings to Bombay, which in her telling is a truly stunning chaos of peoples, cultures and religions." "Exciting and suspenseful . . . [The Widows of Malabar Hill] features Massey’s literary strength in dynamic character development and lyrical prose." "The moment we heard about Perveen, India's first woman lawyer who solves crimes, we knew we had to get our hands on this book. And The Widows of Malabar Hill didn't disappoint. Sujata Massey paints a beautiful historical landscape of 1920s Bombay and the many cultures living there at the time." "A tightly-crafted mystery, a vividly-drawn multicultural setting, and a plucky heroine fiercely taking on the challenges of her time." "Certain to please a wide range of readers . . . [Perveen Mistry] won’t take no for an answer, she’s hungry for knowledge and justice, and she’s on her way to making history." "The Widows of Malabar Hill is an exquisite tapestry weaving together mystery with a crash course in colonial India, its customs, and the expectations of women in the 1920s . . . It also brings you the sights, smells, and tastes of 1920s India (which may make you crave coconut rice at 2 a.m.)"
"Perveen Mistry is a terrific heroine." "A fascinating look behind the curtain of women’s lives in pre-Independence India." "The mystery is a strong one because readers must acquaint themselves with this unfamiliar world in order to piece together what happened. And what can I say about the setting? Massey pulled me right into this world, and I was almost on sensory overload. The old ways versus the new. Bombay's rapid growth into a vibrant major city. The various political, religious, and social factions that chafed against each other on a daily basis. And one woman, with the support of her parents, who's strong enough to stand up for what's right. A+"
"Well written, highly detailed, and engaging, THE WIDOWS OF MALABAR HILL shows Massey's extensive writing experience, as well as an acute eye for human frailty and conflict. I'm glad to note from her material that there's a sequel on the way." "The Widows of Malabar Hill is a gorgeous epic, a significant statement on women's rights, a fascinating armchair tour, and, yes, a thriller of a murder mystery." "I could envision this series being televised by the BBC or Masterpiece: Mystery! (Hint, hint.)" "Perveen Mistry is a wonderful creation." "A fascinating setting and great characters." "Rich with culture and customs of different facets of Indian society . . . It’s like I could imagine the traffic on the street—it was that vivid." "The Widows of Malabar Hill introduces you to Perveen Mistry, a feminist character you will instantly fall in love with . . . The plot tackles gender equality, religious tolerance and communal harmony and that is what makes the character a true inspiration." "Launches Sujata Massey’s new historical mystery series in fine style . . . The Widows of Malabar Hill shows that Massey has been inspired both by her newest creation and her setting, with the promise of a great series to come." "A refreshingly original mystery . . . What comes through most strongly in this entertaining work, though, is the status of women, and how much Perveen had to accomplish to get where she is."